EAST SHORES STAGE 1B – WORK IS UNDERWAY! 03 Apr EAST SHORES STAGE 1B – WORK IS UNDERWAY! Gladstone Ports Corporation (GPC) is progressing with its vision to extend the community’s foreshore access through the construction of East Shores Stage 1B. GPC Acting Chief Executive Officer, Craig Walker said he was excited to announce the East Shores Stage 1B Project was off and running and the community can now see progress, with upgraded access via Flinders parade and new carparks already well underway. Mr Walker said the marine works is currently being reconsidered as it would not be prudent to commit to the extraordinary cost, safety concerns and impact on competing facilities within the region. GPC Chairman, Mr Peter Corones AM, said the precinct will offer world-class facilities not only for visitors but our whole community. Road closures along Flinders Parade commenced earlier this year, signalling the start of preparatory works for the project. The new East Shores stage 1B parklands construction is expected to start in May 2019 and is planned to be opened to the public prior to Easter 2020. 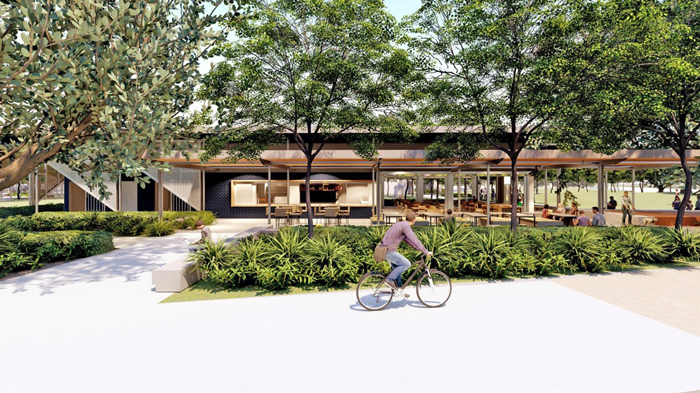 Tenders for the cafe at East Shores 1B will open in the coming months via the QTenders website.